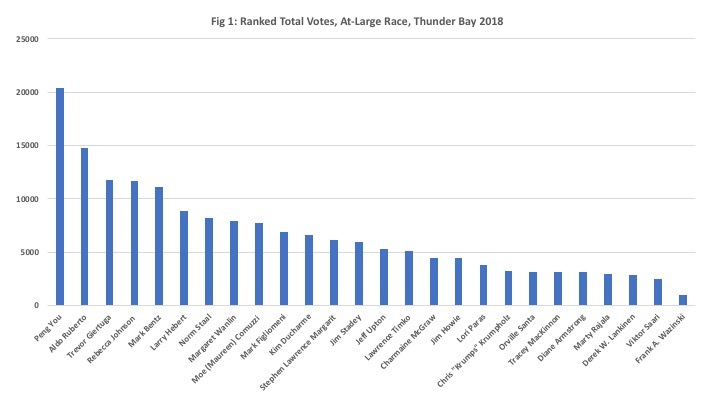 It is now a week since the municipal election in Thunder Bay and as the dust settles I have been doing some retrospective looks at the races and outcomes and providing some vote tallies - first for the Mayoral race, then the At-Large competition and in this last election post - the races for the seven Ward councillors. Down below, I have seven figures detailing the distribution of the total vote in each of the wards and they differ from both the Mayor and At-Large results in that in most of them, the winners took a rather sizeable share of the vote - as high as 65 percent in one of the races. A total of 39,222 ballots were cast for Ward councilors which is lower than the 41,108 cast for mayor. This suggests that there were individuals who voted for mayor and not for their ward councilors. This type of difference was also noted in the At-Large race as the total number of votes cast At-Large was smaller than the potential number given the total vote for Mayor. As for the online/telephone and paper ballot results, there was not substantive difference in the ward outcomes across the two methods with the exception of Neebing where Lynda Rydholm had more paper ballots than Cody Fraser but Cody Fraser won with the online ballots. 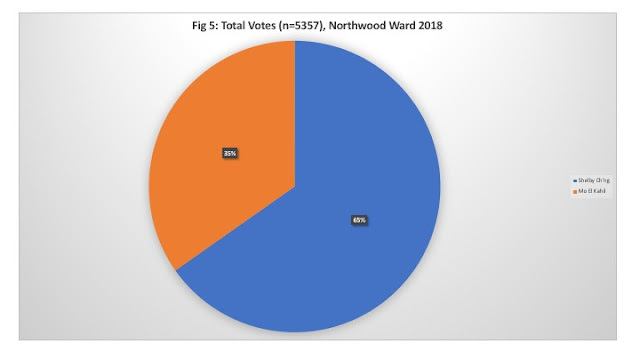 The vote share of the winners ranged from a high of 65 percent for Shelby Ch'ng in Northwood to a low of 33 percent for Cody Fraser in Neebing. 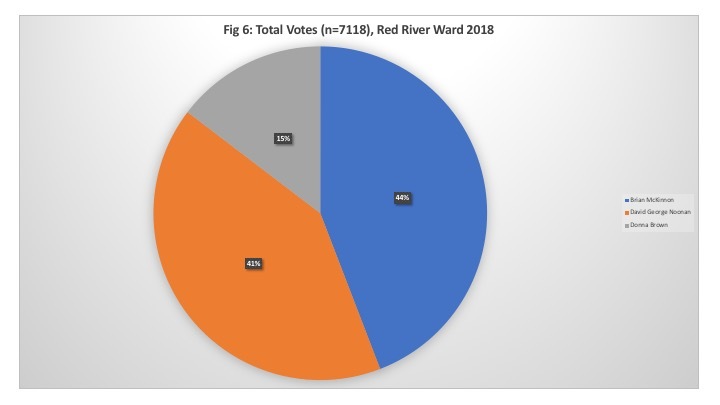 Current River and McIntyre had the next highest winning vote shares at 59 percent for Andrew Foulds and 50 percent for Albert Aiello. After Neebing Ward, the next lowest shares were 42 percent for Brian Hamilton in McKellar and 44 percent for Brian McKinnon in Red River. Kristen Oliver in Westfort won with 47 percent of the vote. On average, the winning vote share across these seven wards came in at nearly 50 percent - 48.6 percent to be precise. Given that the total vote share of the winning mayoral candidate was 34 percent while At-Large candidates won with 7 to 11 percent of total votes cast, it suggests to me that most Ward councilors can reasonably claim to have a stronger representative mandate from their respective constituencies than either the At-Large candidates or even the Mayor. Of course, one of the reasons for the more fractured vote distribution in these other races was the large number of candidates. Even in the ward races, there is some inverse correlation between the number of candidates and the vote share of the winner. Neebing with the most candidates at five saw its winner take the smallest proportion of total votes while Northwood with only two candidates had the winner take the largest share. Still, we have a system of 12 councilors and one mayor with five of the twelve councilors elected At-Large. This hybrid system was due to the Larson compromise which attempted to deal with the strong interurban rivalries still around at Amalgamation in 1970 and the fear that having only ward based councilors evenly split between the two former cities would result in deadlocks. We are nearly 50 years out from amalgamation and the case can be made that the time has come to revisit our municipal system of representation and consider whether we should go to either an all At-Large system or all Ward based system. I think given how Thunder Bay has grown together over the last 50 years, there is less north-south antagonism and rivalry that needs the attention of At-Large candidates. Moreover, I think the At-Large positions detract from the position of Mayor by adding 5 individuals who also have a city wide mandate. 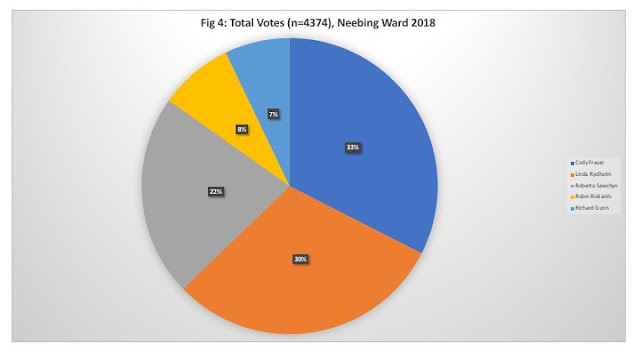 There is less of a case to be made today for electing 5 mini-mayors especially given that the relative mandates and support for ward councilors is actually stronger. There is also a case for reducing the number of councilors at the same time. Thunder Bay has one municipal politician for approximately every 8,500 people while a City like Hamilton (with 15 councilors and a mayor) has one municipal politician for approximately every 33,500 people. And then there is Toronto which given the latest reforms imposed by Premier Ford now has one municipal politician for about every 101,000 people. Thunder Bay could easily go down to a system of either 10 councilors plus a Mayor or even 8 councilors plus a mayor with a redesigned set of ward boundaries. While the actual costs saved are small, it would send a message of frugality to residents given the levels of property taxation were a much mentioned concern. The new council has the opportunity to consider these types of changes especially as we draw near to 2020 and the 50th anniversary of Amalgamation and the creation of Thunder Bay. The results of the October 22nd municipal election in Thunder Bay also saw the election of five At-Large Councilors from a rather large pool of 26 candidates. There are three new At-Large councilors though given two are former councilors (Giertuga and Bentz) there is really only one new face – Peng You. Most of the actual change in the composition of Thunder Bay City council came at the ward level where there are four new faces (Aiello, Hamilton, Fraser and Oliver) out of the seven positions. The new council in the end represents a significant amount of change that will contribute new ideas and approaches but not an overwhelming amount that might lead to a more bumpy ride. To me this also suggests that dramatic change in council composition may be easier at the Ward level because name recognition is much more important in the At-Large races given the large number of candidates – especially this time around. In many respects, the race for an At-Large seat is really a race for five mini-mayor positions as once elected they can claim to speak for the entire city whereas ward councilors can be seen as representing specific ward interests. Every voter gets to vote for five making the total number of votes greater than the actual number of voters creating different dynamics than a ward election. Figure 1 presents the ranked total ballots for each of the At-Large candidates and they range from a maximum of 20,346 votes for Peng You to a low of 973 votes for Frank Wazinski. After the two leading candidates - Peng and Aldo - there is a drop off to the next three with not that many votes separating them – Giertuga at 11,718, Johnson at 11,692 and Bentz at 11074 – and then another drop to 8,807 with Larry Hebert. Thus, given this particularly large pool of candidates, the critical number of votes to win was just over 11,000 or just under 7 percent of the total votes cast (172,523) for At-Large candidates. This perhaps explains why so many choose to run for Councilor At Large – given that there are five votes per elector – one can win a seat on council with a relatively low percentage of the total votes cast. Ward races on the other hand seem to have stiffer competition and a larger share of the total is required to win. Figures 2 to 4 plot some rather dizzying figures of the distribution of the vote for the paper ballots, online telephone ballots and total ballots and they generally parallel each other pretty closely. Unlike the mayor's race which I examined in my last post, there was no major difference between online and paper ballots among the front runners. Peng You essentially captured about 12 percent of the total ballots cast which in the end does not seem like a particularly strong mandate. On the other hand, perhaps the better point of comparison is the number of votes cast for Mayor which provides a more accurate estimate of the number of voters participating. Of the 41,108 individuals who cast a ballot for mayor, one can argue that 20,346 of them cast a ballot for Peng You or nearly 50 percent of voters. Interpreted this way, Peng’s accomplishment is quite astounding because if one looks at the race for mayor, the winner only captured 34 percent of votes cast. In the same manner, the next highest At-Large candidate – Councilor Ruberto at 14,745 – captures nearly 36 percent of the voters –also slightly better than the mayor’s performance. Of course, what is also of note is that if one takes the number of votes for mayor – 41,108 – and multiplies by the number of votes you are allowed to cast At-Large, you get at pool of At-Large votes equal to 205,540. However, the total number of votes cast At-Large was only 172,523 – about 16 percent less meaning that some chose to vote for fewer than five At-Large candidates. In the end, these results are interesting because they suggest that at least two of the At-Large winners may be more popular than the mayor which all but ensures they may want to consider a run for mayor the next time around. However, that is four years away and a lot can happen during four years that can erode your political capital. It is always risky to be more popular than the boss and standing out can also make you more of a political target. Still, one cannot deny that the stand out feature of this year’s At-Large race was the victory of newcomer Peng You given the energy of his campaign and the size of his win. I suppose local sentiments may be best summarized borrowing from the words of the immortal Alexandre Dumas – it was All for Peng and Peng for All! With all of the candidates signed up and off and running, it is now time for the candidates running for municipal office in Thunder Bay to present their platforms and debate the issues they feel will define and shape municipal government here over the next four years. 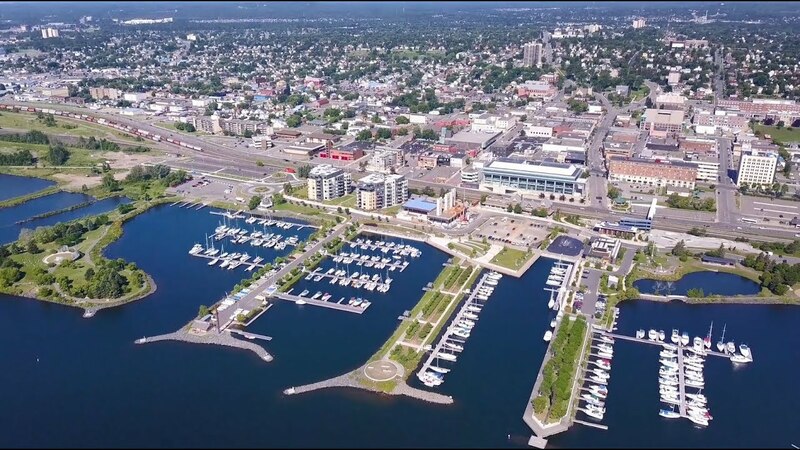 While no one can predict the future, there are a number of issues that face municipal government in Thunder Bay and will affect its ability to deliver public services. The role of municipal government is technically not to provide services to the public but to provide services to the owners of property. However, when said and done what the City of Thunder Bay ultimately does is provide public services to everyone. First and foremost, municipal services need to be paid for and so a key issue is the long-term fiscal sustainability of municipal services in Thunder Bay. This of course then becomes tied to property tax rates, provincial grants and user fees – the three main sources of revenue. The City’s finances in terms of its credit rating are good though as I have noted before it is easy to be prudent when the ultimate budgetary insurance is simply raising taxes. However, given that there has been a gradual shift to the residential property tax base, the candidates will need to address how much more can the residential taxpayer bear in terms of increased tax rates especially when the tax rate increases have been accompanied by rising user fees for water. What can be done to make city services more cost-effective? Second, there is the city’s social fabric within which we can include crime rates – particularly homicides – as well as the homeless population, racism, poverty and the growing use of food banks. The social fabric of Thunder Bay is a crucial issue given its effect on both the quantity and quality of life for its residents. It is also an important issue from the prospect of attracting new investment in the city given the poor press Thunder Bay garners in major media outlets in the Toronto area. While there is reason for hope, at the same time continued hope requires action. How can we deal with our pressing social issues? Third, is the issue of future municipal governance. Thunder Bay currently has a council of twelve plus a mayor with five of the councillors At-Large and the remaining councillors ward-based. We do need to have a conversation as to whether this is still the best institutional framework for municipal decision making. The At-Large/Ward hybrid harkens back to Amalgamation in 1970 as a compromise to deal with the need to make city wide decisions in the face of strong regional loyalties to the old municipalities and neighborhoods. However, it is not 1970 anymore and some thought should be given not only to having a smaller council - as a signal that there is a commitment to efficient government - but also one that is either all Ward based or all At-Large. As noted in an earlier posting, my preference would be for an all Ward based system. Fourth, is the general issue of what I would broadly term city development but encompassing not only the city’s economy – about which City Council actually not do much about directly – but also its urban development, infrastructure development (I would include a new bridge over the Kam here) and demographics. Aside from providing an environment conducive to business via tax and regulatory policy and ensuring cost-effective and appropriate services and infrastructure, City Council cannot really turbo start the local economy. That is a function of national and international economic conditions and the demand for what we do here. Ultimately, what can we sell to the rest of the world from Thunder Bay? Tourism is one area where we can still do more as a city. However, we are also hampered economically by having a spread-out city that is costly to service with new housing developments springing up willy-nilly in outlying areas. However, we have made some progress in core-specialization with many government services in the former south downtown and a thriving cultural/arts/restaurant scene on the north side adjacent to the waterfront. We also face an aging population that is quite pronounced given that so many of our youth have left. While the First Nation’s population is young and growing, much work needs to be done to ensure they are equipped with the human capital necessary to maximize their economic potential and many of those tools are under the purview of the federal and provincial government. There are no easy or quick answers here but one hopes candidates have pragramtic and workable ideas. Finally, I am somewhat cautious about bringing up the next point but feel that I should despite the fact it is the kind of thing that some candidates may latch onto and neglect the more important and difficult issues already covered. We can all recall the last municipal election when the debate was consumed by the Events Centre with all other major issues relegated to the sidelines. Still, I would be remiss if I did not mention that 2020 will be the 50th Anniversary of the creation of Thunder Bay and we should give some thought to what type of events or projects we will use to commemorate Thunder Bay’s amalgamation in a manner that is positive and celebrates our potential. Again, I have had thoughts on this in the past but there may be other ideas out there. So, without further ado. Let the campaign debates begin! The nominations are closed and what a difference an additional week makes. 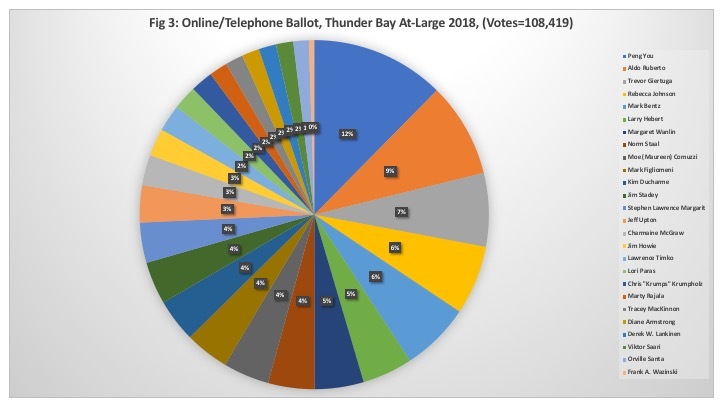 When you add up all the candidates, as of 5pm today there are now a total of 101 individuals running for office in Thunder Bay’s fall municipal and school board elections – up from 78 in 2014 – and a total of 61 running for City Council – more than the 51 of 2014. So, it would appear that despite changes to the municipal nomination process for the 2018 election – a shorter time period for filing to run as well as the requirement of 25 signatures of support – there are more than enough people who want to fill municipal office. However, a closer examination of the numbers suggest that the interest is greater for the Mayor and the At-Large Councillors. Compared to the 2014 election, the number of candidates for Mayor is up from 6 to 11 – a 83 percent increase while the number seeking at At-Large position grew from 19 to 26 – an increase of 37 percent. 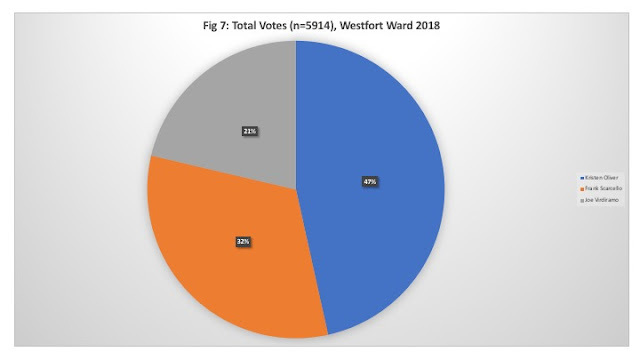 However, those seeking a Ward Councillor position fell from 26 to 24 – an 8 percent drop. On the bright side, numbers for both the Lakehead and Separate Boards were also up from 2014. Well, what a difference a couple of weeks makes. It would appear that the fall municipal election has finally caught the attention of the local community and the number of candidates is up considerably from my post two weeks ago. In my July 7th post, I noted that with only a few weeks to go before the July 27th deadline, the number of candidates who had filed for election in Thunder Bay's city council race was down dramatically. However, since then it would appear that a larger number of candidates have come forward. 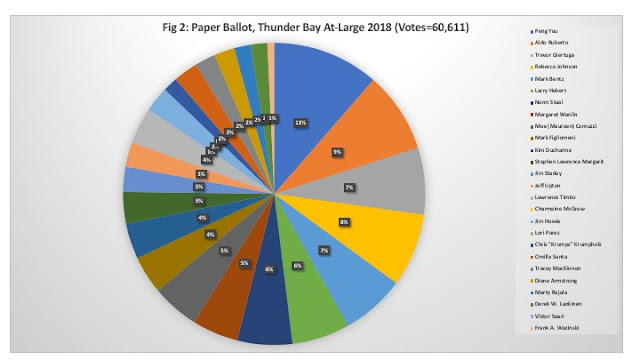 In the 2014 election, the total number of candidates (including all the school boards) was 78 of whom 51 were running for spots on Thunder Bay City Council. As of today, there are a total of 67 candidates registered of whom 40 are seeking a spot on City Council. While the numbers are still down, the gap is not as great as several weeks ago. The remaining week will likely see other candidates come forward. For those of you who might think yours truly will be inspired to run I can assure you it is an honor I do not currently aspire to. (I thought the italics would be an amusing touch). However, I am certainly glad others are taking the initiative first because the role is important and second because the perambulations of Thunder Bay City Council are often a source of inspiration for my blogging. Why So Few Seeking Municipal Office? With the July 27th nomination deadline for municipal office in Ontario rapidly approaching, attention has been drawn to the observation that the number of candidates seeking municipal office in Thunder Bay seems to have dropped. 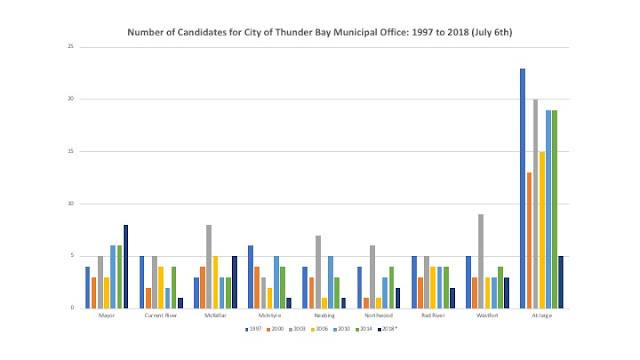 The accompanying figure plots the number of candidates seeking a position on Thunder Bay City council as of July 6th. With the exception of the race for Mayor which has seen a healthy increase in both the quantity and quality of candidates, there has been a drop in most of the other ward races with McKellar Ward being an exception. 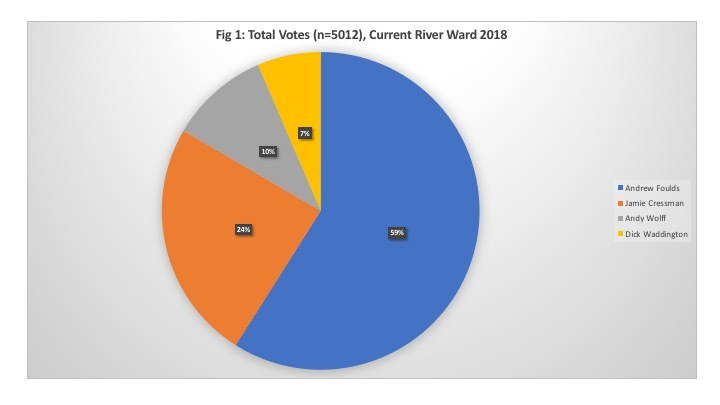 Current River had four candidates last election while at present there is only one. McIntyre and Neebing also only have one candidate whereas they had four and three respectively last time. Northwood and Red River are down to two each from four each last time and Westfort only has three compared to four last time. The drop is most noticeable in the At-Large Race which had 19 candidates in 2014 and only 5 to date. The total number of candidates for the City of Thunder Bay was 51 in 2014 and currently sits at 28 – a drop of 45 percent. Of course, the decline in the At-Large race is partly a function of the fact that a number of At-Large councillors have opted to run for Mayor. Given that the number of candidates running for Mayor has grown while the councillor candidates have declined, it suggests that being the top dog in Thunder Bay is perhaps a more attractive job than being a councillor. 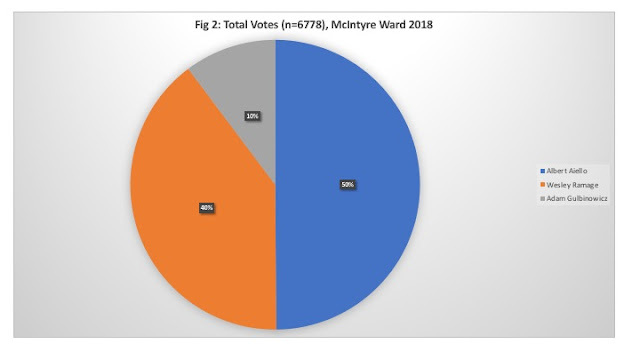 Another possibility is that there is a general lack of interest in running for municipal office in Thunder Bay this time given that the same faces have had the positions locked up for years barring the entry of fresh faces and repeated defeats have reduced the candidate pool in the long run. Even though there are now some openings, there may also be a feeling of why bother given the headaches of holding office in a city with so many economic and social challenges. Yet, there may be other explanations. Explaining this decline, the Thunder Bay City Clerk has suggested that the earlier deadline compared to other years may be a factor. In the past, candidates had from January 1st to mid-September to decide to run but a change in the Ontario Municipal Act shortened the period to May 1 to July 27. 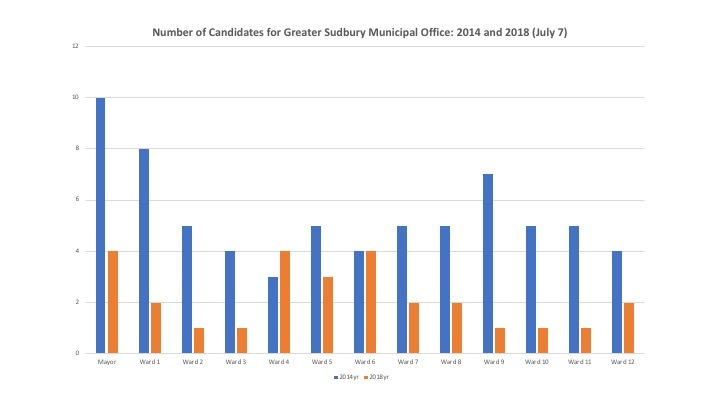 This could indeed be the case given that Greater Sudbury, which is a larger city than Thunder Bay at present (July 7th) also only has 28 municipal candidates seeking office down from 70 last time and they have 12 wards plus a mayoral race. There were ten candidates for Mayor in Sudbury in 2014 and currently there are only 4. Of the twelve ward races, ten are down from 2014 (See Figure). If this drop in the number of candidates is replicating itself across Ontario it means that the changes to the Ontario Municipal Act that have shortened the nomination period may actually serve to reduce the quality of our local democracy by having the unanticipated effect of reducing the candidate pool. Deciding to run for office is not something that one takes on lightly and a longer period to decide may be beneficial. Certainly, having the deadline in the middle of summer when minds are preoccupied with vacations may also not be a help. On the other hand, if you are going to run why should a shorter decision period matter? Perhaps there are other changes that have occurred that have made filing more onerous? Has the volume of paperwork or the fee required gone up? There are still about three weeks left to go before the nominations close. We will have to see if a surge in candidates declaring occurs.